Charles N'Zogbia was the architect of a fine Wigan victory as they came back to beat Hull in front of a sparse crowd. Hull took the lead before half-time when Geovanni stepped up to stroke home a free-kick from just outside the area. Sensing a lack of urgency, Wigan brought on N'Zogbia at half-time and the Frenchman soon beat Boaz Myhill. James McCarthy's long-range shot then put Wigan ahead before N'Zogbia got his second and Scott Sinclair sealed victory in the 90th minute. Although the game finished with a flourish, the first half was a poor affair in front of a measly 5,335 spectators. Perhaps they were anticipating a reserve match between the two teams, but although there was a combined total of 13 changes the sides looked strong on paper. On the pitch, however, the first period was only illuminated by a fine run by Sinclair who clipped the bar and Geovanni's goal-scoring free-kick 10 minutes before the break. Kamil Zayatte was brought down by Titus Bramble just outside the box and the Brazilian stepped up to curl the ball into the top corner. Thankfully, N'Zogbia's introduction at half-time had an almost immediate effect when Jason Scotland's through ball found the substitute and he slipped it past Myhill. The former Newcastle man then turned provider when he squared to McCarthy whose shot went in with the aid of a deflection. Wigan were now on the front foot and they claimed a third goal just two minutes later as N'Zogbia received the ball from a short corner and clipped in a fine shot from the left-hand side of the area. Sinclair then put extra gloss on the scoreline in the last minute when he scored a fine goal after breaking into the box to blast home. "Charlie is a world-class player. I think this season we have seen consistency in his play and that is very pleasing. "He played fantastically well and made a huge difference. His attitude was very good and his football is something the fans would pay money to watch. "With such atrocious conditions I would not blame anyone for not taking the risk to come. "I don't like the way we played in the second half and I would like to apologise to the fans. The second-half performance wasn't acceptable. "A lot of people talk about the FA Cup still having its magic but when you look at the size of the crowd it was a poor turnout. It was a poor turnout from us in the second half as well. "As a manager I was very comfortable at half-time, probably the most comfortable I have felt. I felt we controlled the game and defended well when we needed to. "In the second half, for some reason, that went by the wayside. The threat of N'Zogbia's pace on the left-hand side seemed to be a constant thorn in our side and we didn't deal with it sufficiently." 90:00+3:52 The match has reached full-time. 90:00+3:23 The ball is delivered by Jozy Altidore, Richard Garcia takes a shot. Save by Michael Pollitt. 90:00+2:43 Ben Watson takes a shot. Save by Boaz Myhill. 90:00+1:35 Scott Sinclair fouled by Mark Cullen, the ref awards a free kick. Michael Pollitt takes the direct free kick. 90:00+0:19 The assist for the goal came from Ben Watson. 90:00+0:19 GOAL - Scott Sinclair:Wigan 4 - 1 Hull Scott Sinclair scores a goal from inside the penalty box to the top left corner of the goal. Wigan 4-1 Hull. 89:47 Short corner taken by Charles N'Zogbia. 89:39 The ball is delivered by Titus Bramble, Kamil Zayatte makes a clearance. 86:05 Unfair challenge on James McCarthy by Jozy Altidore results in a free kick. Direct free kick taken by Michael Pollitt. 84:55 Jason Scotland produces a left-footed shot from deep inside the six-yard box which goes wide of the left-hand upright. 83:46 Direct free kick taken by Antonio Amaya. 83:46 Booking Mark Cullen goes into the referee's book for unsporting behaviour. 83:36 Foul by Mark Cullen on Hendry Thomas, free kick awarded. 81:00 The ball is sent over by Maynor Figueroa, save by Boaz Myhill. 78:05 Substitution Jan Vennegoor of Hesselink leaves the field to be replaced by Jozy Altidore. 76:40 Direct free kick taken by Titus Bramble. 76:40 Substitution Ben Watson replaces Hugo Rodallega. 76:40 George Boateng gives away a free kick for an unfair challenge on James McCarthy. 73:56 Hugo Rodallega takes a shot. Save by Boaz Myhill. Scott Sinclair takes a shot. Save by Boaz Myhill. Scott Sinclair takes the inswinging corner, Boaz Myhill makes a save. 72:43 Tom Cairney takes a shot. Blocked by Titus Bramble. Corner taken right-footed by Deiberson Geovanni, save made by Michael Pollitt. 70:27 Substitution George Boateng on for Peter Halmosi. 69:01 Tom Cairney produces a left-footed shot from outside the penalty box and misses wide left of the target. 66:42 Substitution Mark Cullen on for Kamel Ghilas. 65:54 James McCarthy provided the assist for the goal. 65:54 GOAL - Charles N'Zogbia:Wigan 3 - 1 Hull Charles N'Zogbia gets on the score sheet with a goal from the edge of the penalty box to the bottom left corner of the goal. Wigan 3-1 Hull. 65:35 Corner taken short by Charles N'Zogbia. 65:22 Jason Scotland takes a shot. Blocked by Steven Mouyokolo. 63:16 Unfair challenge on Peter Halmosi by Mario Melchiot results in a free kick. Tom Cairney takes the free kick. 62:17 Assist on the goal came from Charles N'Zogbia. 62:17 GOAL - James McCarthy:Wigan 2 - 1 Hull James McCarthy finds the net with a goal from just outside the area to the bottom right corner of the goal. Wigan 2-1 Hull. 61:10 Free kick awarded for a foul by Jan Vennegoor of Hesselink on Titus Bramble. Direct free kick taken by Hendry Thomas. 60:39 Free kick awarded for a foul by Maynor Figueroa on Bernard Mendy. Richard Garcia restarts play with the free kick. 59:08 Titus Bramble challenges Jan Vennegoor of Hesselink unfairly and gives away a free kick. Kevin Kilbane takes the direct free kick. 58:06 Hugo Rodallega is ruled offside. Free kick taken by Boaz Myhill. 54:37 Jason Scotland produces a right-footed shot from the edge of the area and misses to the left of the goal. 53:46 Charles N'Zogbia takes a shot. Save by Boaz Myhill. 52:26 The referee blows for offside. Titus Bramble takes the indirect free kick. 52:16 Jason Scotland challenges Jan Vennegoor of Hesselink unfairly and gives away a free kick. Kevin Kilbane restarts play with the free kick. 51:04 Maynor Figueroa takes a shot. Save by Boaz Myhill. 50:44 Foul by Jan Vennegoor of Hesselink on Hendry Thomas, free kick awarded. Hendry Thomas takes the direct free kick. 49:05 Effort from the edge of the box by Hugo Rodallega goes wide of the left-hand upright. 46:51 Assist on the goal came from Jason Scotland. 46:51 GOAL - Charles N'Zogbia:Wigan 1 - 1 Hull Charles N'Zogbia fires in a goal from close range to the bottom left corner of the goal. Wigan 1-1 Hull. 46:30 Free kick awarded for an unfair challenge on Tom Cairney by Hugo Rodallega. Kamil Zayatte takes the free kick. 45:56 The ball is crossed by Richard Garcia, Jan Vennegoor of Hesselink has a headed effort at goal from deep inside the area missing to the left of the target. 45:01 Substitution Jason Koumas leaves the field to be replaced by Charles N'Zogbia. 45:00+2:08 The ref blows to end the first period. 41:53 Foul by James McCarthy on Deiberson Geovanni, free kick awarded. Boaz Myhill restarts play with the free kick. 38:56 Free kick awarded for a foul by Peter Halmosi on Mario Melchiot. Free kick taken by Michael Pollitt. 36:37 The ball is swung over by Scott Sinclair, Steven Mouyokolo manages to make a clearance. Outswinging corner taken right-footed by Scott Sinclair played to the near post, clearance made by Bernard Mendy. 35:52 Tom Cairney produces a left-footed shot from just outside the penalty box that misses to the left of the target. 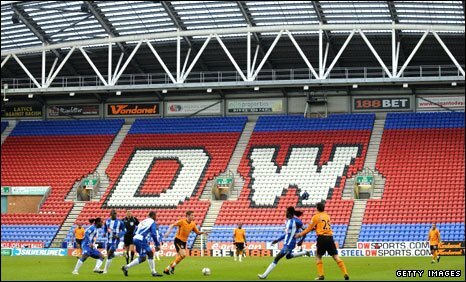 34:39 GOAL - Deiberson Geovanni:Wigan 0 - 1 Hull Deiberson Geovanni grabs a goal direct from the free kick from just outside the penalty box to the top left corner of the goal. Wigan 0-1 Hull. 33:28 Titus Bramble gives away a free kick for an unfair challenge on Kamil Zayatte. 32:56 The ball is delivered by Deiberson Geovanni. 30:01 Free kick awarded for an unfair challenge on Kamel Ghilas by James McCarthy. Deiberson Geovanni produces a strike on goal direct from the free kick. 28:02 Bernard Mendy crosses the ball, save made by Michael Pollitt. 22:43 Jason Scotland concedes a free kick for a foul on Kamil Zayatte. Boaz Myhill takes the free kick. 20:06 The ball is crossed by Richard Garcia, Headed effort from deep inside the penalty area by Kamel Ghilas goes harmlessly over the crossbar. 18:34 The assistant referee flags for offside against Jan Vennegoor of Hesselink. Michael Pollitt restarts play with the free kick. 18:16 James McCarthy takes a shot. Blocked by Steven Mouyokolo. 18:02 James McCarthy takes a shot. Boaz Myhill makes a save. 17:35 The ball is swung over by Scott Sinclair, clearance by Kamil Zayatte. 14:34 Effort on goal by Scott Sinclair from just inside the penalty box goes harmlessly over the target. 14:13 Peter Halmosi gives away a free kick for an unfair challenge on Mario Melchiot. Free kick taken by Mario Melchiot. 12:18 The ball is crossed by Scott Sinclair, Hugo Rodallega has a headed effort at goal from close range which goes wide of the left-hand post. 11:25 Deiberson Geovanni takes a shot. James McCarthy gets a block in. 8:32 Inswinging corner taken by Deiberson Geovanni. 4:30 The ball is delivered by Scott Sinclair. 0:49 The referee blows for offside against Kamel Ghilas. Michael Pollitt restarts play with the free kick.